Dr. Marco Cueva now welcomes people who need treatment for receding gums in Frisco, TX, to visit his Allen practice office for the Chao Pinhole® Surgical Technique (PST™) without a referral. This procedure offers rapid relief from symptoms such as sensitive teeth while protecting patients from unwanted side effects of traditional gum recession treatments. Dr. Marco Cueva is now making the Chao Pinhole® Surgical Technique (PST™) available to people who suffer from receding gums in Frisco, TX even if they do not have a referral. These patients can now secure immediate relief from unwanted symptoms, such as sensitive teeth and bone loss, by visiting Dr. Cueva’s dental practice in Allen for this revolutionary new treatment. Compared to other techniques, PST™ offers patients various unique benefits, including reduced discomfort and shortened healing times. PST™ differs from most gum recession treatments in that it does not require any grafting of healthy tissue. Instead, Dr. Cueva places a tiny incision in the receding tissue and uses specialized tools to move the tissue into a healthier position. Dr. Cueva then uses collagen strips to secure the gums in their new position without sutures. Given its minimally invasive nature, this treatment for receding gums in Frisco, TX, offers patients immediate cosmetic improvements as well as unusual health benefits. With PST™, Dr. Cueva can eliminate many of the adverse side effects associated with other gum recession treatments. During one appointment, Dr. Cueva can typically correct even widespread recession, which makes PST™ a convenient treatment option. The procedure, which causes minimal pain or bleeding, quickly addresses undesirable side effects of gum recession, such as sensitive teeth and bone loss. Many patients can resume their regular activities immediately after treatment. Dr. Cueva is committed to offering patients the most efficient, comfortable treatments available, and he is proud to make this new option available to people who live with receding gums in Frisco, TX, without the necessity of a referral. Patients who would like to learn more about PST™ are urged to visit Dr. Cueva’s website, http://www.perioexcellence.com. Patients who notice symptoms of gum recession, including sensitive teeth, changes in visible tooth length or root exposure, are encouraged to schedule consultations and learn whether PST™ is a viable treatment option. Patients may request appointments through Dr. Cueva’s website or by calling his office at (972) 704-1101. Periodontic Excellence is a periodontal practice offering personalized dental care for patients in Allen, TX. 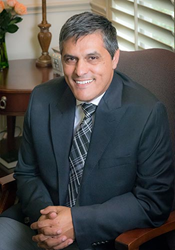 Dr. Marco Cueva is a Board Certified Periodontist and has extensive education in periodontology and dental implantology. He attended the Federal University of Parana where he received his Doctor of Dental Surgery Degree, and completed three additional years of training at Camillo Castelo Branco University, before training at Baylor College of Dentistry. Dr. Cueva also earned his Masters of Science Degree in Oral Biology with a certification in Periodontics from Texas A&M University Health Science Center- Baylor College of Dentistry. Dr. Cueva offers a variety of services, specializing in dental implants, All-on-4® and the minimally invasive Chao Pinhole® Surgical Technique for treating receding gums. To learn more about the services offered at Periodontic Excellence, please visit the website at http://www.perioexcellence.com or call (972) 704-1101 to schedule an appointment.